"I haven't found peace of mind yet." A film like Ten is tough to criticize because it seems to have accomplished all of its goals. Writer, director, cinematographer, co-editor, and co-producer Abbas Kiarostami is a strikingly minimalist filmmaker and one has to admire his courage. Not just his courage to make a movie that is nothing more than a woman driving around the streets of Tehran, but also the fact that he would make a movie that questions the laws and societal norms of Iran's dictatorial theocracy. However, despite the bold vision of Kiarostami, when a movie is bad, even if it succeeds at being what it wants to be, it's still bad. There's really no story to speak of in Ten. A nameless woman, played by Mania Akbari, drives around the city over a period of ten days. Each day has a short segment, running roughly ten minutes apiece, which features her interaction with those in her life. The opening scene—where her young son, Amin (Amin Maher), verbally abuses her—is truly shocking. However, Kiarostami keeps the camera only on the boy for the whole scene. I found it tough, if not impossible, to relate to the Driver when I never got to see her. The rest of the movie features the woman running errands and living her life, but it isn't until over a half-hour into the film that we actually get to see her eyes. There's something about being able to see an actor's eyes that makes them more available, more significant. The fact that Kiarostami keeps so much of the Driver's feelings and motivations hidden from the audience makes it nearly impossible to understand or appreciate her life. At times she's sympathetic, especially when she picks up an elderly lady and gives her a ride to a place of prayer. But at others, she's a cold-hearted, selfish person. Take for instance the scene where the Driver's sister gets in the car after her husband walks out on her. The Driver never once offers a sympathetic word, but only hurls insults because her sister is emotionally distraught. What is the audience to make of this? Undoubtedly this is Kiarostami's point. None of the female characters in the movie is given a name, which seems to be a strong indictment of Iran's oppressive, misogynistic policies. But it's easy to point out injustice, so what's the big deal here? Kiarostami shouldn't just be content with portraying these different women in difficult situations, he should find a moral in the story (like, say, To Kill a Mockingbird does) that seeks to improve the situation. Instead of telling a story, Kiarostami relays a slice of life and thus the film ultimately becomes hollow. None of the scenes, especially the one in which the Driver picks up a prostitute, have the effect they should have. Perhaps Kiarostami believes that by removing a narrative drive he would cause the audience to empathize with the hopeless situation of his lead character; instead it makes these conversations feel drawn out and ultimately pointless. Apart from the lackluster storytelling, the actual filmmaking is pretty dismal as well. It's always tempting when watching an independent minimalist film to say, "I could do that." Normally this is clearly not the case, but sadly it is true about Ten. All Kiarostami does is take a mini-DV camera and place it on the dashboard of a car. He doesn't use any post-production sound mixing, which causes a lot of the dialogue to be drawn out by background noise and at times the volume levels are too high for the microphone. Nor does he use any additional lighting, which results in the night scenes being too dark to discern the image. Some critics and audience members will look at this and think it has to be the work of a genius. Perhaps they are right, but geniuses can make mistakes in their judgment. This is clearly a case of poor filmmaking. Accompanying the poor direction and screenplay is one-note acting by the entire cast of non-actors. The Italian neo-realists also used non-actors, but those directors were able to use their cast's authenticity to heighten the sense of realism. Here, the performances seem too one-dimensional to be natural. The worst of the bunch is Amin Maher. His high-pitched voice does nothing but yell when he is on screen. At first the dialogue being spoken is brutal to his mother, but eventually it becomes tiresome. Really, how long does one have to sit and watch a boy yell at his mom? After the first five minutes, you can't help but hope she'll slap him across the face and throw him out of the car. Abbas Kiarostami is a man with a strong vision and he never wavers away from it, but his vision is near-sighted. Image Transfer Review: The 1.33:1 pan-and-scan transfer abandons the film's original aspect ratio of 1.66:1. It is a harsh, unpleasant experience because of the original video source material. Colors are dull, detail is weak, depth is virtually nonexistent, and grain is strong. However, none of these flaws can be attributed to the transfer. Like the movie itself, this transfer accomplishes its job, but the end result still isn't satisfying. Audio Transfer Review: The mono Farsi sound mix, like the image transfer, is aesthetically disappointing on account of the source material. Dialogue is at time so high-pitched that it is distorted. At other times, it is drowned out by background noise. None of this is the fault of the sound mix, so in that regard it can't be held against the mix. Nonetheless, when the sound is as unpleasant as this, it can't be recommended to home theater enthusiasts. Insert�features an essay written by director Abbas Kiarostami, as well as his filmography. Extras Review: Accompanying the feature is an insert containing an essay (apologia?) by director Abbas Kiarostami. He explains the purpose of the movie and how difficult it is to make films in this style, but I found it difficult to take a single word he says seriously. There also is a list of his prior credits included on the insert's inside back cover. Following that is a feature-length documentary by Kiarostami about the film. 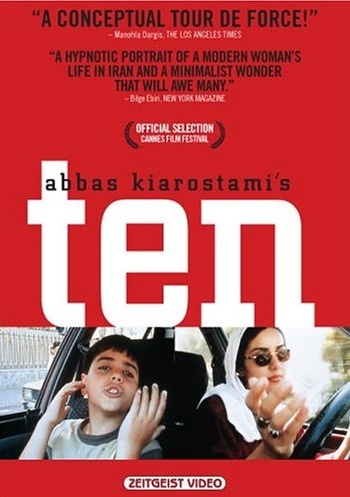 Abbas Kiarostami: 10 on Ten (01h:23m:29s) is just like the feature movie, since it is just one shot of Kiarostami driving in his car. To call it a documentary is a bit of a stretch, since it's really just a lecture about his style of filmmaking. Listening to Kiarostami's theories about the artform will probably either enrage or encourage those watching this feature. It's safe to say that those who like Ten will like this documentary, and those who don't, won't. Ten is certainly an avant-garde title and won't have a wide appeal. The image and sound transfers are not very flattering on this DVD, but that is a result of the source material. The supplemental material is nothing more than a stubborn continuation of Kiarostami's wrong-headed direction, so I recommend you pass this one up.